Do you ever feel misunderstood by others? It's most likely because of their perception of you. Do you ever feel misunderstood by others? Maybe you feel that people at work don’t get you. Or that your friends are not on the same page. Maybe others truly don’t get you. But that’s not because of them, it’s most likely because of your own behavior. I’ll tell you why. When I started working for a major IT research firm in London several years ago, it was the first time I worked in an organization with thousands of people. On my floor alone, there were probably two hundred people at work. For me, it was the first time that I was a part of such a big team. One of the most important lessons I have learned from my mentor about working in large teams is this: People can only judge their perception of you. And often, there’s a difference between perception and reality, right? I’ll give you an example. One of my friends recently went through an intensive job interview process, with multiple interviews and committees. In other words: You’re not listening to what we’re telling you. I know my friend. He’s not defensive. He’s a moral person with strong values. But he often does feel the need to explain himself to everybody. And this might come across as defensive. He asked me what I thought about his story. Based on my own mistakes, I told him what one of my mentors told me: Perception is reality, keep that in mind. Look, no one cares about your real intentions. Not because they are heartless or selfish. It’s because people simply don’t have the time to conduct a psycho-analysis on every single new person they meet. That’s why we have heuristics. We make decision short-cuts all the time. And one of the shortcuts we make is to judge what we see. Now, that might not be the best thing. It’s always better to collect more information before you judge someone. But the truth is that heuristics work. They make our lives easier. There’s nothing you and I can change about that. 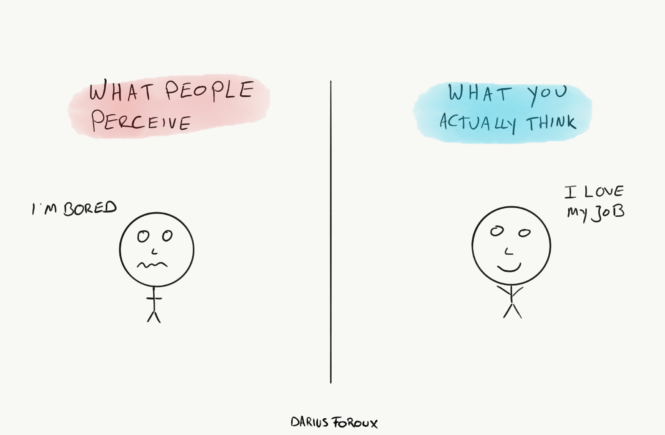 By now, you might wonder “How do I change other people’s perceptions?” The answer lies in the science of influence. But the science of influence has nothing to do with that or snake-oil salesmen tactics. How does our behavior influence the behavior of others? How does other people’s behavior influence our behavior? I’ll give you an example. My perception of one of our team members was that she lacked interest in our business. So we talked about it. From that conversation, I got the feeling this was another case of “perception is reality.” In fact, my perception was wrong. I told her about why perceptions matter and gave her one influence tip: Mirroring. Most of us know about it, but very few apply it consistently. When you mirror someone’s body language and words, the other person gets the feeling you like them. And that automatically makes us like the other person. That’s how we’re wired. So instead of just sitting still and looking at someone during a conversation (which makes people think you’re indifferent), use your body language and words to influence others. MAKE others believe you’re engaged. There’s nothing fake about that. You know why? No one can smell what you think inside that brain of yours. Somehow, we must let others know. I’ve studied influence for more than a decade. I know when people try to influence me. And most of the time, I love it. To me, it’s a sign that others are making a conscious effort to work with me. You just have to guard yourself against ill-willed persuaders; people who try to make you do things you don’t want. Fortunately, to be honest, that doesn’t happen very often. What happens more in our connected world is that malevolent persuaders try to make us believe in things that are false or useless. We’ve all seen the reports about fake news. This phenomenon is really present in society, and it influences other people’s behavior. You can only protect yourself from these ill-willed persuaders by studying influence. No matter what you do, start applying the perception is reality mindset to your life, right now. The next time your spouse thinks you’re lazy, maybe that’s because you made her believe you are. And if people at work think you’re bad at receiving feedback, maybe that’s because you made them think you’re not coachable. Look inwardly. Change your behavior for the better. And always be mindful of how others perceive you. Especially, if you want something from them. If you want to hear more thoughts on why perception is reality; listen to my podcast episode about it.